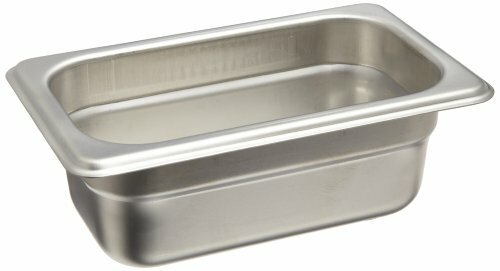 Carlisle DuraPan 608002 18-8 Stainless Steel Heavy Gauge 10.40 Qt Full-Size Pan, 20-3/4'' Length x 12-3/4'' Width x 2-1/2'' Depth by Carlisle at Main Street Deli and Cafe. MPN: 608002. Hurry! Limited time offer. Offer valid only while supplies last. This Carlisle DuraPan food pan fits standard food pan templates. It is made of 18-8 gauge stainless steel for strength and resistance to corrosion. This Carlisle DuraPan food pan fits standard food pan templates. It is made of 18-8 gauge stainless steel for strength and resistance to corrosion. It has double-reinforced corners and an impact-resistant edge for maintaining its shape. It has a spoonable bottom for a maximum serving yield and easy cleaning, and the pan is stackable for convenient storage. It can be used in a freezer, oven, and serving line, and it fits into a Coldmaster pan for retaining cold temperatures and eliminating the need for ice. This food pan meets NSF International standards for use in food handling and processing and is dishwasher-safe.